It looks like the Zionists and their AZZ (anti-Zionist Zionists) allies are losing the battle. The more desperate they are to stop ‘The Wandering Who’ and myself, the more they manage to do the complete opposite. The book is now a best seller and its message has gone viral. So far every attempt to smear the book and myself has backfired. It started in mid-September with veteran Israeli concentration camp-guard Geoffrey Goldberg insisting that professor John Mearsheimer should admit that he was endorsing a ‘Hitler apologist’ and an ‘anti-Semitic’ book. But Mearsheimer refused to bow. On the contrary, not only did he reinforce his praise for the book(1), in a masterpiece of superb writing, he also exposed Goldberg’s clumsy and deceitful hasbara tactics. On the very same day that Goldberg launched his attack in the USA, here in the UK the notorious Zionist mouthpiece the Jewish Chronicle (JC) together with pro-war, Neocon, and thoroughly Islamophobic Harry’s Place (HP) joined forces with Britain’s once-progressive Guardian. The Guardian has already grovelled before the Zionists and labelled me as an ‘anti Semite’. Why? Because I dared to discuss the ‘Jewish Lobby’ and criticise ‘Jewish Marxism’. It’s clear that, for the Guardian, Jewish politics whether it be Israeli lobbying or tribal Marxism is quite simply beyond examination, discussion and criticism. But still, it was a rather foolish move by the Guardian because within less than 48 hours the ‘Guardian’s new dangerous cult’ had been exposed by one of the most admired reporters on Israel-Palestine - Jonathan Cook. Cook’s article spread like wildfire and, within hours, it had appeared on every dissident outlet around the world. The Guardian has lost a lot of support recently. Its betrayal of Wikileaks and Assange was a clear sign that something was deeply rotten with the UK‘s once ‘progressive’ paper. I guess that The Guardian’s outrageous attack on myself (as well as on Counterpunch Magazine and Alison Weir) was just one more nail in its coffin. But fortunately for us all, The JC ‘s /Guardian’s assault, translated into immediate and massive book sales that took even my publisher and myself by surprise. Mind you, it had already begun to dawn on us that bad Zionist press was worth its weight in gold. I suppose it was around this time that the tribal cheerleaders began to realise that they might have a bit of a problem. All their attempts to stop the book had failed but this did not lead them to draw the necessary conclusion. Instead of making any attempt to critically and intellectually engage with the text, they decided to bring out the big guns. Two leading Zionist ‘celebrities’ were schlepped out to do battle - the infamous Abe Foxman and Alan Dershowitz. These two caricatures were quick to take off the gloves. However, they too failed to realise that, this time around, they were taking on someone who has earned a reputation for not pulling his punches. 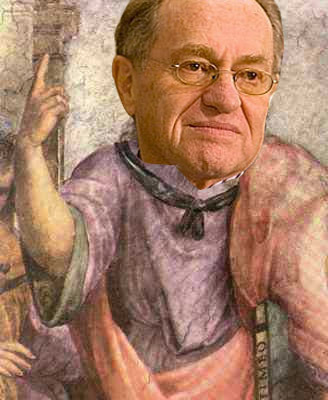 Notoriously deficient intellectually (as well as being a plagiarist), Dershowitz fell into the same trap as Goldberg, The Guardian and The JC. Instead of trying to dismantle the book and its message by means of deconstruction, he decided to try to bully two of America’s most distinguished intellectuals - Richard Falk and John Mearsheimer, both of whom were amongst the first to endorse ‘The Wandering Who’. But soon it became clear that the tide has changed. No one took any notice of the Zionist bully. Mearsheimer didn’t even bother to respond to Dershowitz’ drivel and Falk dismissed the Zionist ‘celebrity’ smear as defamatory polemic. If Dershowitz had one drop of dignity in him, which I doubt, he would have done the decent thing and just faded away. But as it happens neither Dersohwitz nor his allies have an ounce of self-respect in their systems. Interestingly, this lack of self-respect and dignity, which stops any form of critical self-reflection, is symptomatic of the whole Jewish identity political discourse. It is precisely this failure to learn from past mistakes that makes Jewish politics so dangerous – particularly for Jews. If Dershowitz and his ilk were half as clever as they think they are, they would have paused awhile to reflect on their failures. But instead, they just go on with their endlessly futile power games – only to find out that their influence is steadily withering away. Driven by biblical, vengeful enthusiasm, my detractors thought that they could instead bring my international jazz career to an end. But destroying my music career was never going to be easy. To start with, I’m good at what I do and I have a strong fan base which, totally familiar with my thoughts, supports both me and my convictions. So it’s obvious that Jewish lobbies mounting pressure on music festivals is not going to much serve the Jewish cause. If anything, it will prove once again that Jewish identity politics is not only dangerous to our foreign policy, it is also dangerous to our cultural life. In spite of the fact that not a single performance of mine has ever been cancelled due to pressure, my detractors still will not give up. Ahead of my concert in Goettingen Jazz Festival last Saturday, the local Jewish community, together with the Anti Deutsche, an Israeli hasbara mouthpiece, tried to pressure the Festival organisers. But the Festival didn’t surrender- its Art Director insisted that no one would interfere with his artistic decisions - not even the Goettingen Jewish community. The Festival looked into all the cherry-picked, out-of-context and sometimes forged quotes provided to them by the Jewish community, and concluded that ‘Gilad was not an anti Semite’. But the Jewish community still didn’t give up and within a day or two, the news had spread out of Goettingen, generating some very bad publicity for the Jewish community all over Germany. This clear, Israeli-inspired and crude attempt to intervene with German cultural life has, in fact, bought me many more fans in Germany. The concert sold out and many more people in Germany are now aware of the fact that one ex-Israeli jazzman openly equates Israeli ethno-centric, racist, expansionist ideology with Nazi politics. Should I thank the Goettingen Jewish community for their intensive PR campaign? Yes, I should and yes do. Yet again, it became clear that Jewish bad press is all I needed. In the last few days the Zionist Lobby here is putting pressure on ‘Raise Your Banners’, a legendary UK Folk festival. They want Gilad Atzmon to be dropped from the program. Just like Goettingen’s Jewish community, the Zionists here insist on interfering with British cultural life and unfortunately, not in a good way. I wonder how cultured people in Britain will react once they learn that an Neo-Con, and Award Winning Islamophobic Harry’s Place is poking it’s 'collective' nose into their folk culture by campaigning against one of Britain most popular Jazz artist and a humanist who is endorsed by some of the greatest intellects of our time. Let me tell you, this will not make our ‘Zionist friends’ very popular. But I suppose that some Jews in Germany in general and Goettingen in particular were also not too happy with these developments imposed on them by their Zionist brothers and sisters. Five days before the Goettingen concert, I learned that some representatives of the local Liberal Jewish community asked to meet me ahead of my concert in an attempt to reach a peaceful and harmonious solution to this saga. The liberal Jews basically wanted to express their disgust at the actions taken by their fellow Jews against the Festival and myself. Always believing n dialogue, I welcomed the approach. By the time I was in a packed hall and on stage in front of the most supportive audience ever, it was clear that some elements within Goettingen Jewish community had made the grave mistake of acting against me and against their local community. Jewish Diaspora organisations futile dedication to my destruction is both revealing and symptomatic. Like the Jewish State itself, they cannot see the consequences of their actions. The Israelis, the Dershowitzes, the JC, J-BIG, IJAN and HP, all are blind to their growing estrangement from the rest of humanity. As they bully and smear, they end up shouting in the echo chamber of their own cyber shtettles. It doesn’t look good, but, this is the harsh reality of that same Zionist collective psychosis which I scrutinize in The Wandering Who. How do I know this? Well by now and for a decade, I have won every battle and, to be honest and I even learned to enjoy it.